During the summer months, the Dufferin Terrace in Old Quebec City, Canada becomes a fairly busy place with tourists, cruise ship passengers, artists, musicians, mimes and other types of entertainers. Overlooking the St. Lawrence River, the Dufferin Terrace provides some spectacular scenery with the beauty of the historic hotel, the Chateau Frontenac, watching over the waterfront. 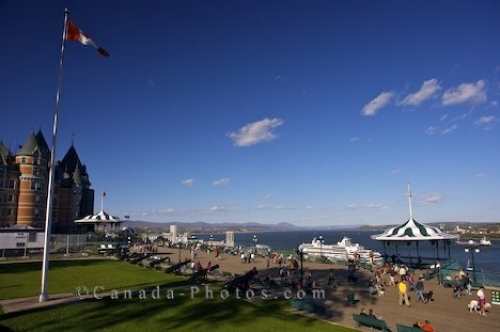 Picture of people strolling along the waterfront at Dufferin Terrace in Old Quebec in Quebec City, Canada. Terrasse Dufferin, Dufferin Terrace, in Old Quebec, Quebec City, Quebec, Canada. UNESCO World Heritage Site.